This book contains reproductions of sketches and etchings done during the period from 1975 to the present. The images are California coastal scenes ranging from Trinidad above Eureka in the north, to Limekiln Beach near Lucia on the lower Big Sur coast. Also included are a number that were accomplished in the San Francisco Bay Area. Most were done from the perspective of the shore, but some were completed from the waterside using the GAMBELLA, a boat that I owned in the early years. In a number of images the GAMBELLA is the subject matter. The sketches are executed in pen and ink and some contain tonal areas of ink wash. There is one exception, a pencil drawing of the GAMBELLA. The balance of the images are etchings. An etching is one of several original print mediums. Other original print mediums include engravings, woodcuts, linocuts, lithographs (from a stone), silk-screens, and monotypes. An original print is presented in the same medium in which it is accomplished as opposed to a reproduction which is usually a conversion from some other medium. The conversion is made to a print medium such as offset lithography and involves a camera of some kind. Original prints are usually produced in limited editions which are numbered and signed by the artist. 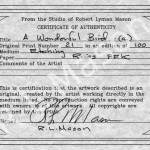 In addition, a Certificate of Authenticity is often provided. An etching is printed off of a metal plate, usually copper or zinc, which has the image incised into it. The incising is accomplished by selectively exposing the plate to an acid which “bites” the plate to form the image. The plate is initially covered with an acid resist called a “ground” and then worked with a sharp point to expose the metal beneath the ground. The plate is then submerged in an acid bath which etches the plate where the metal has been exposed. The printed lines thus produced have a look very similar to those produced by a pen. There is a similar process called “aquatint” that produces tonal areas which, when printed, are close to the look of an ink wash. Consequently, sketches accomplished in pen and ink wash translate quite nicely to etchings with aquatint. Making the plate is usually in iterative process. Some work is done on the plate and then it is “proofed” to check on its current state. Then more work is done and the plate is proofed again. This continues until the artist is satisfied that the image printed is what was intended. This procedure is necessary because the artist works in the negative (light lines on a dark surface) and in reverse (mirror image). When the plate is complete the edition is printed. Printing is accomplished by smearing the plate with an oil based ink. The surface of the plate is then wiped clean leaving the ink in all the incised areas. The inked plate is placed on the “bed” of an etching press, covered with a piece of damp, high quality paper and run through the press under high pressure. The paper is forced into the incised areas of the plate, contacting the ink and printing the image. The whole process, including the printing, is handwork and labor intensive. An etching can usually be identified by the impression of the edge of the plate embossed around the perimeter of the image. When working directly on the plate from nature, one can use an interceding mirror. I have, on occasion, positioned my van so that the subject matter is reflected in the outside rear view mirror. When a sketch is accomplished prior to the etching, its basic features can be transferred to the ground on the plate face down to act as a guide for “needling” the plate. A counterproof can be made from a freshly printed image. This is done by placing another sheet of paper over the image while the ink is still wet and running it back through the press under pressure. There are some galleries (and artists) who will attempt to pass off reproductions as original prints. They will number and sign the image and provide a Certificate of Authenticity. Sometimes they will even go to the extent of embossing a plate mark around the image. This is ethically questionable but legal as long as they use the word “reproduction.” If they call it an original print, they have definitely overstepped. Any time you see edition numbers that run into the thousands you are probably looking at a reproduction. In this book there are reproductions of 42 sketches and 25 etchings. The distinction and a brief description appears on the facing page. In addition, the sketches have borders with sharp corners and the etchings have borders with slightly rounded corners. In some cases both the sketch and the etching that was made from it are shown. Enjoy!